Like e-gift cards, e-donations have become very popular because they are easier and cheaper to send, manage and track. Many charities and nonprofit organizations now offer a digital version of donations. Rybbon makes it easy to offer e-donation as a gift. 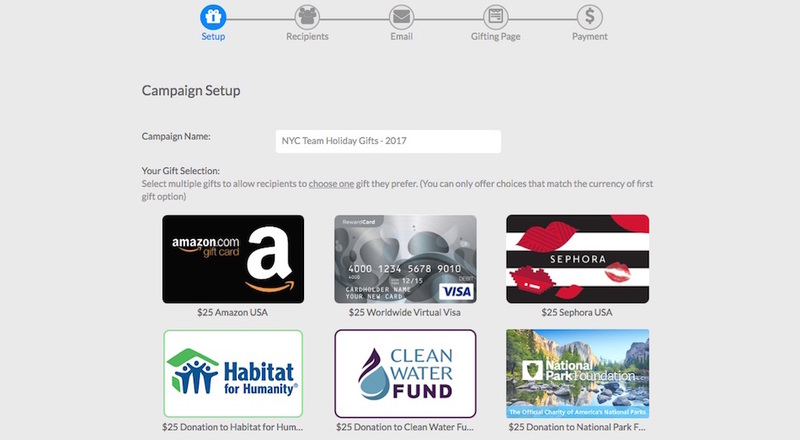 When setting up your campaign, simply add e-donations to your gift selection. The recipient then has a choice to select a gift for themselves or select a charity to which they want to donate the gift amount. This year you are tasked with your company’s holiday gifting program again. Last year, you sent e-gift cards to all employees, customers and partners and brought smiles to everyone’s faces. This year, you can add e-donations to your gift selection. An e-donation can be even more thoughtful, kind and heartwarming. E-donations are also versatile. You will want to use it all year round for survey or research incentives, webinar invitations and reward programs. By gifting e-donations, you and your recipients will both be making a difference and giving back to the world. Whether it is improving the lives of people or the environment, an e-donation is a gift both you and your recipients can feel good about. 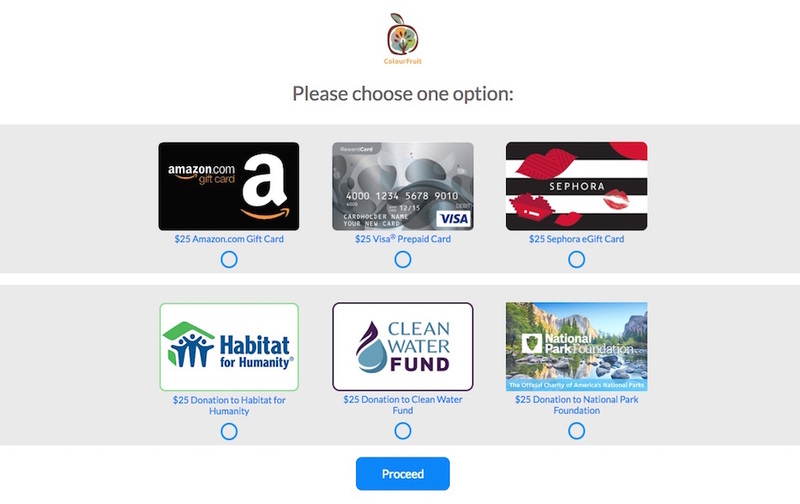 Show your customers and employees you care about causes and issues- When you gift e-donations to your customers and employees, it shows that you care about causes–whether it is finding a cure for cancer or supporting our national parks. 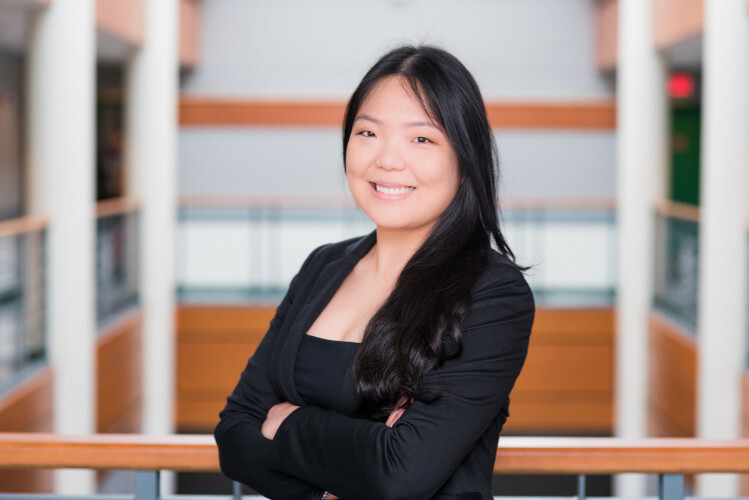 E-donations will resonate well with your customers. After all, everyone can get behind clean water or cleaning up the environment. Accompany your gift with a personal message that explains how and why you chose this particular charity gift. It’s perfect for the charity-minded recipient- E-donations are perfect for the charity-minded recipient who derives meaning and satisfaction from helping others. Your charity-minded recipient will feel they are making a positive impact and giving back to the community. Whether it is supporting medical research or building homes for families in need, an e-donation is a gift your recipient will feel good about. It’s great for customers who are shy about accepting gifts- Do you have that one friend who is always shy about letting you pay for a cup of coffee? I know I do. Similarly, we all have a few customers who are shy about accepting gifts. 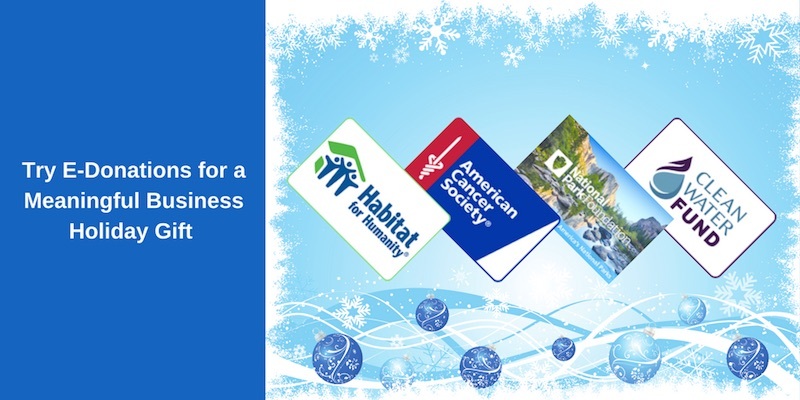 In lieu of e-gifts, give these customers the ability to donate their gift with e-donations. Instead of feeling they are taking something from you, they’ll know that the e-donation is going directly to a good cause. With Rybbon’s new e-donations offering, it’s easy to make a donation on your customer’s behalf and let them know about it. You no longer have to write the checks, stuff them into envelopes, mail them, tally everything manually, etc. Add e-donations as an option to any campaign- Like e-gift cards, e-donations can be purchased directly from your Rybbon account in the desired denomination. You can add e-donations as an option to your e-gift selection to any campaign. Let recipients choose the charity they love- If you’re not sure which causes your customers care most about, you can let them choose the charity they love. Rybbon allows you to setup a selection of e-donations and let your recipients select the charity of their choice. When setting up your campaign, simply add multiple e-donations and e-gifts of the same value to your campaign’s gift selection. Tracking- With Rybbon’s tracking function, you will learn how many recipients chose e-donations and to which charity. This allows you to fine-tune future campaigns in the coming year. It’s easy to see why e-donations make a special and memorable gift. E-donations show your customers and employees that you care about causes and issues. It is perfect for the charity-minded customer as well as customers who are shy about accepting gifts. Rybbon makes sending e-donations as easy as sending e-gift cards. Add e-donations to your e-gift selection this holiday season and use it for all occasions this coming year. Sign up for a Rybbon account to give the gift of e-donations with your next gifting and rewards program.